If you like to game for prolonged period of time, there’s a good chance your posture isn’t perfect. Sure, when you jump on that old couch at first, it feels fine, but after hours and hours of serious playing, the less than ideal seating positions start to take their toll. If you wanted to sit at your desk all day you would get an office chair. Your car manufacturer couldn’t put just any seat in your car, and there’s even specialized seating for reading a book. Just because the activity requires that you remain seated, doesn’t mean that you should use just any chair. Gaming is no different. When you’re gaming you need to be alert, yet relaxed. You want your back and neck to be straight, yet comfortable. You want the c﻿hair to be adjustable﻿ to fit your moving needs. That’s why gaming chairs exist. Their closest sibling is the office chair, but they have enough differences to make them worth it. 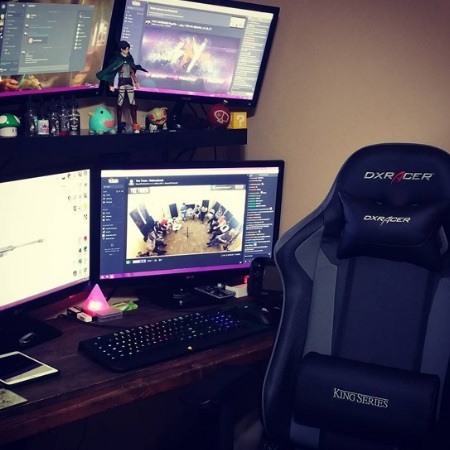 Don’t get fooled by the thousands of dollars gaming chairs, and at the same time watch out for cheap imitation chairs. 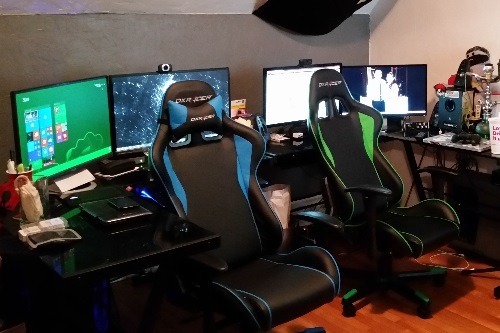 The chair you choose will be your plus-one for all your future gaming endeavors so make sure you choose wisely. The chair you choose will offer your spine the best shot at staying healthy and pain-free while at the same time offering you the best angle and support to keep yourself as comfortably focused as possible. I’m a bit larger than most of my peers. I weigh 220 pounds and am 6 feet tall. This means all the problems of bad posture and spinal pain are magnified for me. The larger you are, the greater the need for proper gaming equipment. This body weight had really begun to affect the health of my back. I was beyond fixing myself with a quick stretch, and it was time to make some changes. This began my excursion of testing and reviewing the several gaming chairs that are out there. One of the first chairs I tried was from the well established company DXRacer. They have been around since 2003 and are used by several e-sports competitions and tournaments. Their notoriety won them a chance to be reviewed. 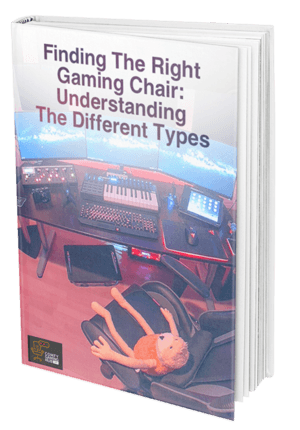 DXRacer has a shopping guide to help you pick the appropriate chair. They use your BMI (a combination of your height and weight) to craft a chair that offers you the maximum level of comfort and support. My particular frame falls into the category of the DXRacer Racing Series. This is a larger version of their best selling F-series. Support Cushions - The lumbar pillow keeps your lower back from hating itself. It is adjustable so you can fit it perfectly for your needs. There is also a headrest pillow. Integrated Headrest - The built in headrest gives your neck support. A good headrest is paramount for your gaming chair. ​Larger Backrest - A taller and wider backrest suited for a larger individual like myself. ​Cold Cure Foam - High density foam that is designed to be both comfortable and long lasting. ​Tough Frame - Tubular steel and a metal base make the frame. So durable that the frame comes with a lifetime warranty. Angle Adjuster - You can adjust the backrest to your preferred angle. It can go nearly all the way back so you could even take a nap if you wanted to. 4D Armrests - The armrests are adjustable as well. They can move at every angle, so you can completely remove them from the picture if needed. Is It The Right Fit? - Make sure that you selected the right chair from the shopping guide. If you are too small or too large for this model, it will obviously not fit right. Most of the negative reviews I saw showed a much smaller person complaining about the chairs fit. Check The Gas Cylinder - On a few occasions I noticed some people receiving a lemon gas cylinder. The chair is designed to hold up to 250 pounds, so test out the gas cylinder and see if the chair is perfectly supporting your weight. If the cylinder is budging a little bit or a lot, send it back for a free exchange. Missing pieces - Of the few people who complained about something missing, most spoke of a missing washer or seat cover. This wasn’t common, but it’s something to look for. There wasn’t much criticism, as most of the public was happy with the chair. The consensus is that this chair is quite durable. Even the few negative reviews admit that the chair is in great condition after months of use. Most people love the angle adjuster. People are quite happy with the stability of the adjusting process. The chair is heavy, and takes some time to assemble, but this appears to be the reason that chair is so durable. The heaviness of the chair is what allows you to sit back at a near 90 degree angle in comfort. Some reviews go so far as to say that this chair feels like ‘physical therapy’ for your back the way the lumbar support kicks in. It is fair to say that a strong majority of people find this chair acceptable for long periods of extended use. 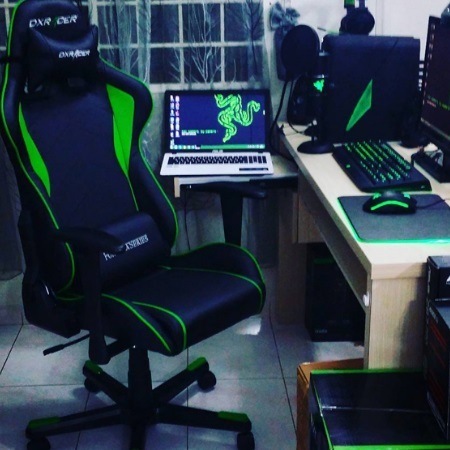 The best place to buy the DXRacer Racing Series gaming chair is Amazon. In fact, the racing series was out of stock on the company’s website, but in stock on Amazon. It usually comes around 400 dollars but Amazon has reduced the price by almost 10 percent. Amazon also includes free shipping and an around 40 dollar option to include professional assembly. 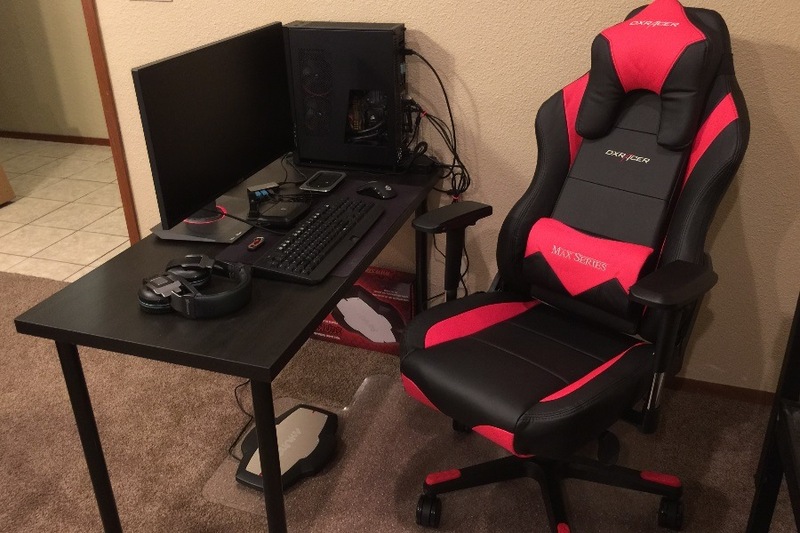 Even after a month of continuous use, the DXRacer Racing Series gaming chair is impressive. It’s comfortable, it looks cool, and it lasts a long time. 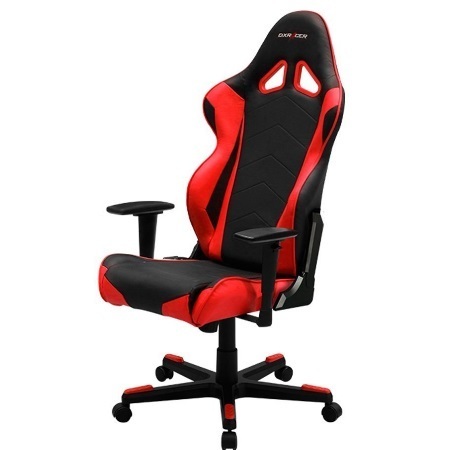 It has everything you could want out of a gaming chair, and if you fit this particular body frame, it’s a great buy.